Stichomythia A deeper insight into the pottering of Mr. George, Mr. Scholes, and Mr. Robson. We’ll also be planning events like this throughout next year so keep checking in to see what we’re up to! So on Sunday Nov 17th I’m playing a filmed studio session at Blue Light Digital Sound and I would REALLY love for you to be a part of the recording/performing process that night. We need 25 people for an optimum night and with each ticket purchase you get a free DVD & CD of the night’s show! Instagram of me holding a copy of my new CD “Transcendence Problematic”. Details about CD release coming soon! I find thinking of the world in terms of nouns and passive verbs to be problematic. I could go into why but I’d rather have a conversation with you* about it. Last year I recorded a post-punk album in a day based on Zeppelin III, classic comicbooks, and avante garde performance art with C.W. Cobalt and Bread Morton. It’s called The Forbidden Mansion of Doctor Salamander and is now available for live streaming here! It may not be your cup of tea. But that’s ok…that just means we didn’t make it for you. I enjoy kale enough to make a whole confession about it. I ate some 1.5 hours ago. Sometimes I feel like it would make sense to consensually have as many offspring as I can through as many different women as possible. Intellectually I know this to be unwise, irresponsible, and potentially deadly. But still. I think earrings make women exponentially more attractive. This may hold true for men as well. I’m working towards doing a split by December 31st 2013. Just because. I played fiddle for American-Folk duo Schucks Road’s EP release at the Bitter End on Wed. Check out their EP called “One If By Land” (feat. me on fiddle) on iTunes. Upon hearing that I was promoted to Asst. Manager at the restaurant I work at, my father responded “My condolences…” My father gets me. I’m in reality and redundantly very thankful to have a job at all…But Still. 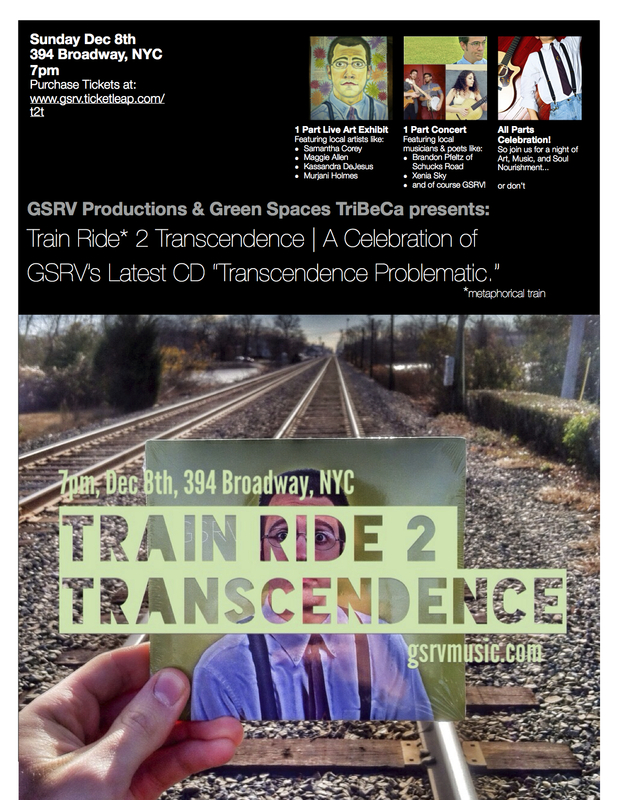 A few days ago I sent the final mixes of my new CD, “Transcendence. Problematic.” to Dave Locke at JP Masters for mastering. In addition to the impending CD release party I’m also planning on filming at least 2 music videos within the next 2 months to promote the new CD. For those of you that are curious as to what I’ve been up to over the last month concerning the new CD, I figured I’d list a few recent adventures of GSRV Music. I should be sending the new CD out for production by next week and then I’ll start planning a CD release party. Keep your eyes open and your ears clean for updates on “Transcendence. Problematic.” so you can get your hands on some of the hottest new music out by GSRV Music! In the meantime, if you haven’t heard the single from the album check out the music video below…and if you dig it, share it on FB, twitter, wordpress…and whatever else you use to tell your friends about stuff. 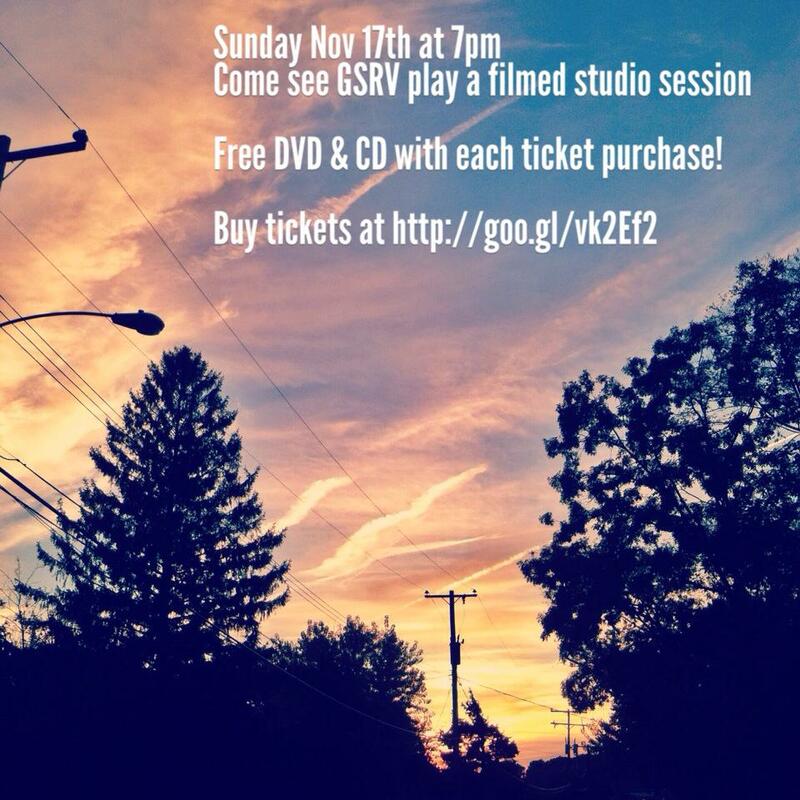 Highlights from the last GSRV Music Living Room Concert Series…enjoy (or don’t…I’m not telling you what to do).